Christmas sixlets are now available in a mint flavor. 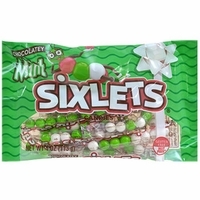 The same sixlets you have always loved in green and white with a fresh minty flavor. These are the perfect stocking candy or to put in your goody bags for holiday treats. They are individually wrapped tubes with approximately 8 mint sixlets per tube. You get 16 tubes per bag.